No matter what condition your basement is in, from partially finished to concrete and studs, the lower level of your home has tons of potential. Family room, home theatre, workout area, whatever you need – CMP can turn this underutilized space into anything you want. After a remodel, it might just become the most popular spot in the house (and for a lot less cash than an addition). At CMP, we’ve designed dozens and dozens of basement spaces that are all unique because each homeowner had a different purpose in mind. The way you plan to use your basement space will help determine the details of your basement design. Whether you are looking to create a man cave, a billiards room, or even a cigar lounge, we have many ideas for the recreational basement bar! Give us your ideas and we’ll put a plan together that you’ll love. A full size “U”-shaped bar is perfect for entertaining large crowds. Smaller “L” shaped bar allows easy walk-up traffic. Maybe you’d like a dance floor area, space for a pool table or a gaming system. Whatever you decide, you’ll be the envy of every man on the block! Home theaters are a great place to gather with family and share some great movie moments. Let CMP create the ultimate movie room with custom built-in entertainment centers that hold your TV, components, and gaming consoles with no messy wires! 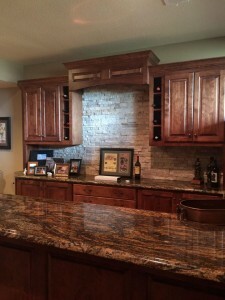 Our cabinetry creates a classy touch adds style and will increase the resale value of your home. We can wire your entertainment traditionally for sound, or even wire it for gaming. 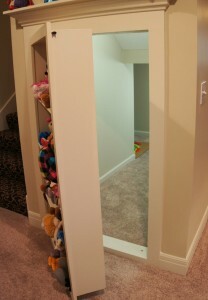 If you have children, a child’s play area is a great way to keep the kids entertained and the upstairs toy-free. We’ve created special areas in the basement just for the little ones to play. Whatever kind of entertainment your family needs, CMP can create the right space. Consider all of the options for design and concept when planning a basement remodel. What about adding a kitchen and a bathroom to make the area more functional? No matter what you use the space for, this option adds incredible versatility and a lot of value to your home. Granite countertops, custom built-in cabinetry, walk-up bar, TV area…CMP can do it all! Besides creating a fully equipped space where your guests are sure to feel at home, this also adds a great living quarters option for your high school/college student, a roommate, or even your mother-in-law. With CMP Construction, you have the option to build an entire full bath complete with custom sinks, walk-in showers, a Jacuzzi tub, or even a sauna or steam room! We pride ourselves on knowing a thing or two about adding bathrooms to basement updates. Whether you’d like a half bath with a basic sink and toilet, a three-quarter bath with a shower, or an ultimate spa getaway bathroom, CMP is the remodel company to call. When adding a bathroom to your basement remodel, doing the job right is critical. Bad plumbing has the potential to cause you incredible difficulty over time. If your home has existing plumbing downstairs, a bathroom remodel affords you the opportunity to either improve upon it or implement an entirely new and custom plumbing system. Our team is certified and excited to recreate your bathroom space, or even start from scratch and completely relocate it to anywhere you see fit in the basement area. Just give us a call! Egress windows let lots of natural light into your basement, but more importantly, they also provide an emergency exit. That means when you sell your home, you can list it with another bedroom – upping the resale value. While these windows can start at $5,500 per opening, the added resale value makes up for the cost. Plus, you get more light!